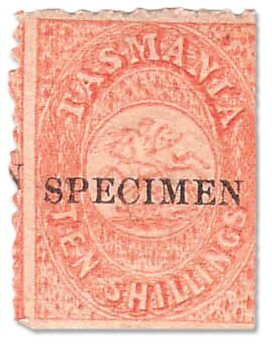 Tasmanian revenue stamps have a long and fascinating history. 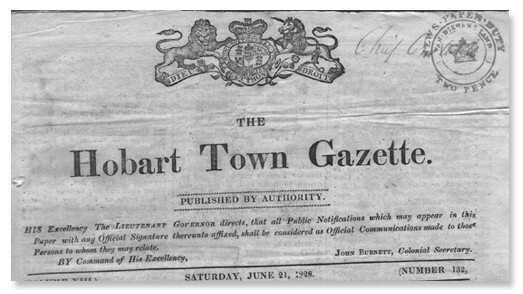 Their genesis arose in 1826 when the Governor, Sir George Arthur, tried to control the press when certain people published articles that he did not like. Here, Bill Lloyd-Smith has done an extensive study on the subject and provides an in-depth chronological review of that history. 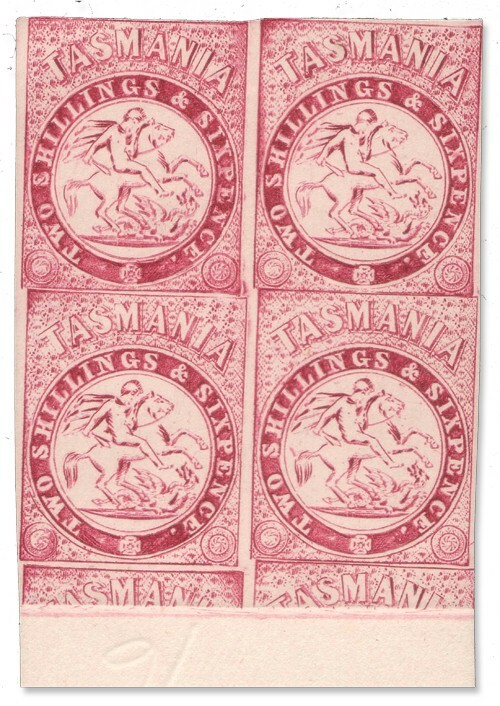 Tasmanian revenue stamps have a long and fascinating history. Their genesis arose in 1826 when the Governor, Sir George Arthur, tried to control the press when certain people published articles that he did not like. Thus he introduced a law to license the press and tax every newspaper at the rate of 2d per newspaper. Andrew Bent, who published the Colonial Times, had incurred the wrath of the Governor and was unable to obtain a licence. He continued to publish and was heavily fined. The duty was imposed by impressing a stamp of value 2d on every copy of every newspaper published. Initially, it appeared in black (October 1827 only) but it was changed almost immediately to orange. Examples of the stamp in black are extremely rare and almost impossible to find. The tax was repealed in 1829 after a strong protest by the colonists to the British Government. The tax lasted almost exactly two years. Andrew Bent was never compensated for the injustice that he had suffered at the hands of Sir George Arthur. After this episode, stamp duties were not levied for over thirty years. On 1 October 1863, a new Stamp Duties Act was introduced. This imposed duties on various transactions and made postage stamps available to revenue purposes. New revenue stamps of denominations 3d, 2/6, 5/- and 10/- were also provided soon afterwards. Chalon head postage stamps are frequently found fiscally used, especially the 1d, 6d and 1/-. The 2d and 4d did not represent any rates of duty so they are less common in fiscally used condition. Initially, no stamps of higher denomination than 1/- were available. On 1 November 1870, the 3d, 2/6 and 10/- St George and Dragon stamps, together with the 1d, 2d and 4d Chalon heads were withdrawn from use. The 5/- was retained until 25 March 1871, when the 5/- Sideface was issued. All old stocks were burnt. The St George and Dragon issues were not valid for postage at this time. From 1871 to 1880, only one series of stamps was issued but they were available for both postal and revenue purposes. On 1 May 1880, an amendment to the Stamp Duties Act came into force. Among other things, it provided that postage and revenue stamps should be strictly separate. The existing stamps were retained for postal use, while new stamps had to be provided for fiscal use. To this end, Louisa Meredith had already designed a new issue of revenue stamps in the well-known Platypus design. These were of denominations 1d, 3d, 6d and 1/- in horizontal format. The plates were of 120 impressions in two panes of 60. The first printing was made by De La Rue in England in 1877 but political considerations prevented their issue until 19 April 1880. They were not valid for use until 1 May 1880. They are watermarked close spaced TAS and perforated 14. De La Rue made a second printing in 1880. In 1894, the plates were sent to Hobart. Stamps from the first printing of 1877 can be found with wing margins. Stamps from the 1880 printing do not have wing margins. A simple explanation is available in Juhl’s book “Postage Stamps and Postal History of Western Australia”, Volume 1, pp. 29-30, where the De La Rue perforations are discussed. The 1d Sideface was withdrawn for about 18 months so that the 1d Platypus could be used up first. When supplies of the 3d Sideface, 6d and 1/- Chalon Heads ran out, the Platypus issues of these denominations remained in use for a number of years. The 6d Platypus ran out in 1891. The 2/6 and 10/- were the only stamps of these denominations available for postage until 1892. The 5/- was apparently withdrawn about 1885 when a new printing of the 5/- Sideface appeared. However, the 5/- Sideface ran out about 1894 or so and the 5/- St George and Dragon was reissued. The 5/- St George and Dragon is often found used in the early 1880s up to 1885 and between 1894 and 1898. The 1880 printings of these stamps are known overprinted SPECIMEN. Two types of overprint were applied to the Platypus issues. The horizontal type of SPECIMEN overprint appears to have been applied by hand to the Platypus and St George and Dragon stamps. (Fig. 4) The vertical format was applied to the Platypus issues using a forme at the Government Printer’s office. (Fig. 5 and 6) This version is also found (in horizontal format) on the Tablet series and many of the Sideface issues. 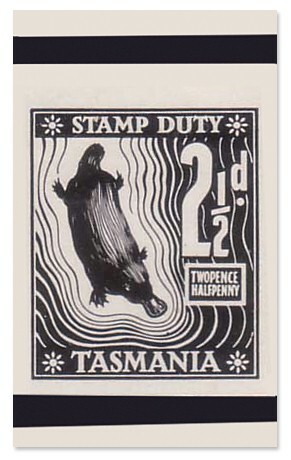 The 1d and 6d Platypus stamps were also reprinted on card paper since stocks of these values ran out. They are usually found overprinted REPRINT (with full stop). With the onset of Federation, postage and revenue stamps had to be separated. To this end, the Post Office published a notice to say that the £1 Tablet, the 2/6, 5/- and 10/- St George and Dragon and all the Platypus issues had been withdrawn from use. They would henceforth only be used as revenue stamps. Old stocks and new printings of these stamps were therefore overprinted REVENUE from November 1900. 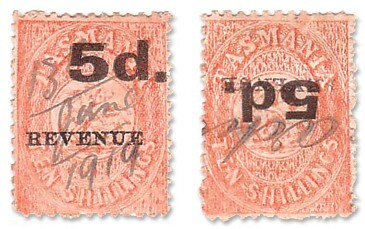 From the surviving records, it appears that stamps without the overprint would not be valid for revenue purposes after 30 November 1900 but no public notice to this effect has been located. 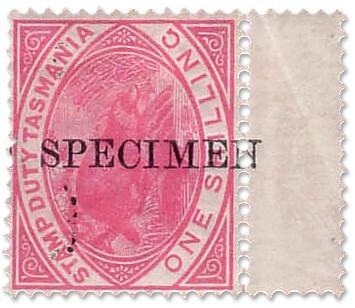 The Stamp Duties Act was amended to ensure that postage and revenue stamps were no longer interchangeable but that amendment only came into force on 1 December 1900. In the meantime, the Revenue overprints were created in November 1900. Old stocks of the 3d, 2/6, 10/- and £1 overprinted REVENUE were issued in November 1900 and a few were used postally, mainly by philatelists. Such usage was quite legal. Only the 3d is normally available to collectors in postally used condition (as distinct from CTO examples) but the three high values are known used together on a cover (of philatelic origin). Until 1904, new printings of these stamps, together with some 1d surcharges on the 3d, were made and issued for fiscal use only. (Fig. 7) The forme for the 1d surcharge of 1904 was recycled to produce the 1½d surcharge on 5d Tablet. Printing records are very incomplete. A number of errors have leaked out over the years. A 2d Platypus was added in 1903 to meet the need for adhesive stamps to pay duty on receipts for amounts exceeding £5 but not exceeding £50. A 4d surcharge on the 3d was introduced in 1905 to meet the revised and increased scale of duties on receipts. Most of these stamps were printed on paper watermarked close spaced TAS but the 1d was printed in 1903 on the old paper watermarked wide spaced TAS with lines. This was an emergency printing to conserve stocks of paper. When cancelled in pen and ink, the penstroke was liable to go through the stamp. 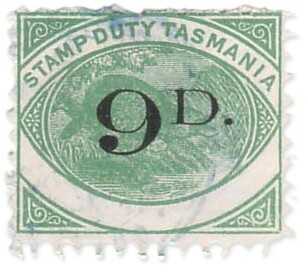 From 1904 onwards, a new series of duty stamps were issued in the Numerals design. It resembles the Numerals design for the low value Victorian revenue stamps but differs in many details. Initially these covered the nine denominations originally provided as stamps overprinted REVENUE but a 4d was added in 1905. The plates were made in Melbourne and initial printings were made on paper watermarked V over Crown (Purves type V4). The stamps were perforated 12×12½ comb but the 1d is also found perforated 11. All values are found with watermark upright and inverted. The perforations and watermarks for this issue are fully discussed in Geoff Kellow’s book on Victoria. Richard Peck has published some printing records from the Reserve Bank Archives for these issues. From September 1906 onwards, the printing of these stamps was transferred to Sydney. 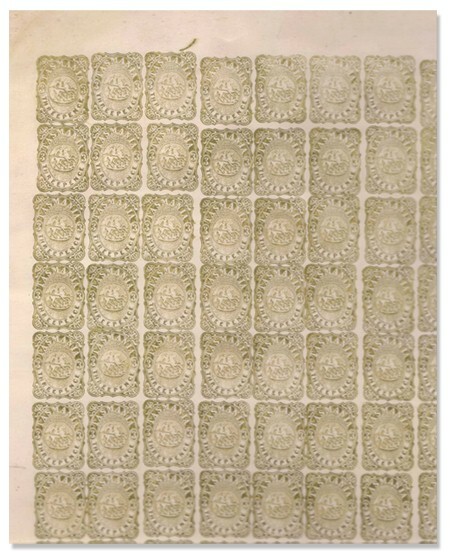 Not surprisingly, the Sydney printings were on Crown A paper as used for the current postage stamps printed in Sydney. The 4d, 10/- and £1 were not printed on this paper. The £1 Tablet overprinted REVENUE was reissued some time after the £1 Numeral design ran out but it is uncertain when this happened. It remained in use up to about 1950. A range of perforations was used for the Sydney printings but the most common gauge is 12×11½. The use of an Instanta gauge is advisable. A few printing records survive in the New South Wales and Tasmanian archives. In June 1907 twenty sheets of the 3d on Crown A paper were surcharged 1/- as they were urgently required to meet a shortage of this denomination. The font is similar to that of the 1d surcharge of 1904 on the 3d Platypus and the 1d + 1d surcharge on the 1½d + 1½d reply paid postcard. The printing information comes from files GP2/10 and TRE6/8/907 in the Archives Office of Tasmania. In 1918, a provisional issue of the 5d surcharged on old stocks of 10/- St George and Dragon appeared. (Figure 8) This was replaced by a 5d on £1 Tablet in 1919, together with a 1/- on £1 about the same time. No printing records have been seen for these surcharges. From about 1920, new printings were made on a new style of paper impressed with Crown over TAS. The appearance of stamps on this paper looks somewhat dirty as the stamps are printed over the Crown over TAS impression. Printings of all values except the £1 were made on this paper. A 5d Numeral design was introduced in 1922 to replace the 5d surcharge. These stamps are normally found perforated 12×11½ but other gauges have been reported. Very few printing records, if any, have survived. In October 1930, the 1d Platypus design reappeared in blue after a break of roughly 25 years. (Fig. 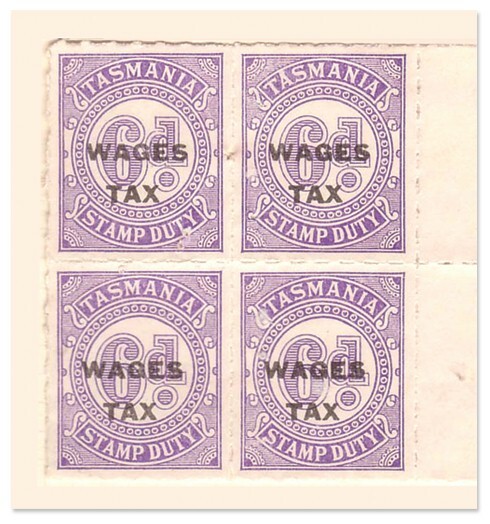 9) The reason for this event is linked to the introduction of a Wages Tax, which came into force on 1 October 1930. This was inspired by the Depression, when Governments tried many different schemes to raise money for their own projects. Cheque duty was raised from 1d to 2d. The 1d Platypus was apparently mainly used to denote the extra 1d duty for cheques. It is not especially common. A 9d Platypus in green was introduced for Wages Tax and a 7/6 surcharge in black was placed on a blank Platypus keyplate design printed in bright orange. (Fig. 10 and 11) A new duty plate was made for the 9d. These stamps are printed on unwatermarked paper. The 1d and 9d are found perforated 11, while the 7/6 is perforated 11.8 (very worn). The 1d and 7/6 are also found rouletted 6¾. In 1934, the 9d Platypus was replaced by a 9d surcharge in black on a blank keyplate Platypus in green. It was printed on unwatermarked paper and perforated 11. In 1940 a new forme was introduced showing the figure of value ‘9d’ in a smaller font. The colour of the stamp was changed to various shades of yellow-brown, reddish-brown and chestnut. These printings were rouletted 6¾. No records have been seen for any of these printings. It was replaced by the 9d Numeral design in 1955. Meanwhile the Numeral design stamps appeared rouletted from 1931 onwards. They were still printed on plain unwatermarked paper and remained in use until the late 1950s. Most of them are fairly plentiful but there are a few scarce varieties. The colour of the 2/6 was changed from violet to orange in 1942 to avoid confusion with the 6d. In the early 1950s, the plates for the 1d and 2d were replaced as they were already worn after more than 40 years active service. New dies and plates had to be prepared. There are many differences in the design as the Craig and Ingles catalogue shows. The 10/- in apple green appeared in 1954 and the 9d Numeral appeared in 1955. These values are quite scarce. (Fig. 12) The plate for the 9d was derived from that of the 1d as there are many similarities in their designs. The £1 Numeral was reissued in 1950 in shades of carmine-lake and rose-carmine. This was issued to replace the £1 Revenue overprint. A ½d surcharge on the 1d Numeral was issued on 1 January 1953 to cover the increased duty on cheques (now 2½d). 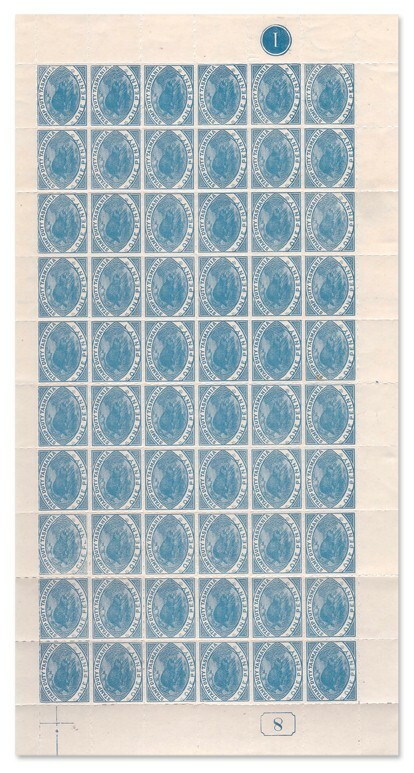 These stamps were initially printed on unwatermarked paper and rouletted 6¾. The ½d black and 2½d red-orange were only useful on old and/or interstate cheques. (Fig. 17) The 2½d is particularly scarce. 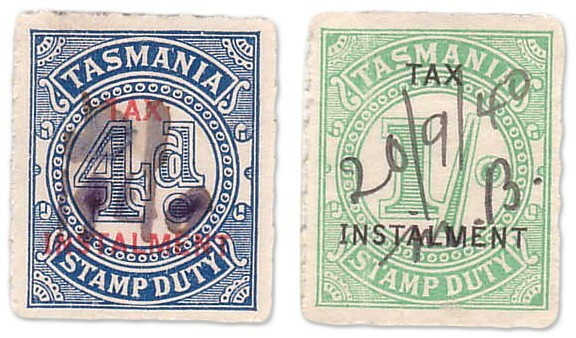 Eventually, stocks of the ½d and 2½d were withdrawn and destroyed since the duty on cheques went up to 3d, due to an Act of the Tasmanian Parliament on 29 November 1956. The 9d and 11d were added to this series in May 1961. Later printings on unwatermarked paper are often found pin-perforated 19-20 or compound with roulettes. I have only seen the 9d and 11d pin-perforated. From late 1961, supplies of these stamps were printed on new paper showing the letter T twice on each stamp. All values except the ½d, 2½d, 9d and £5 exist on this paper. They are found pin-perforated and also rouletted, sometimes in combination. The 11d is scarce on this paper.With the transition to decimal currency, a completely new series of duty stamps was issued in 21 denominations. 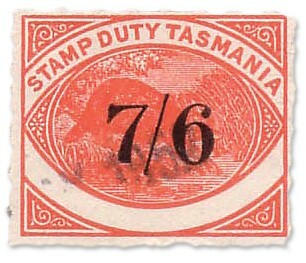 It is believed that old stocks of duty stamps were destroyed at this time. The new stamps range from 1c to $20. Again there were three designs. A Tasmanian tiger was depicted on the 1c to 9c values. 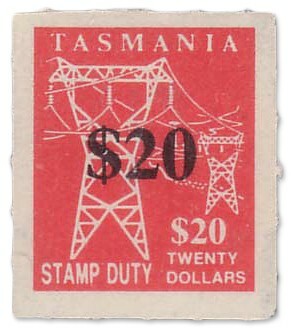 A Tasmanian blue gum was depicted on the 10c to 50c values and a power pylon was depicted on the dollar values. The $20 stamp was actually surcharged $20 before issue, but the reasons for this action are unknown. (Fig. 18) Photographic plate proofs of the 5c, 10c and $5 are known (Fig. 19). It is possible that plates for the other denominations could have been derived from these three denominations. I wish to thank the staff of the Archives Office of Tasmania for their help with the archival references. W.D. Craig and O.G. 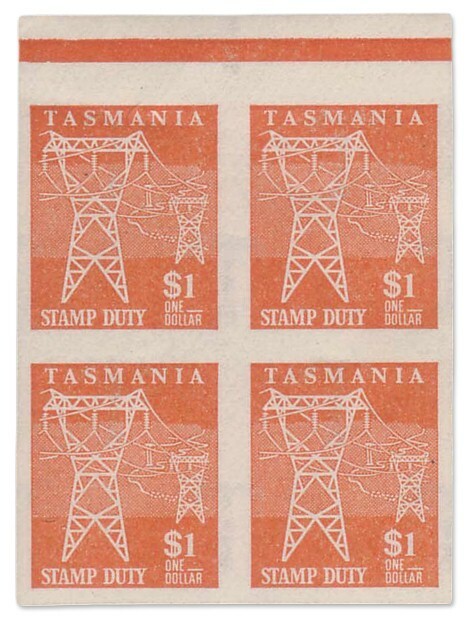 Ingles, “The Revenue and Railway Stamps of Tasmania” Revenue and Railstamp Publications, Dynnyrne, Tasmania, 1978, plus the first and second supplements (1979, 1983). W.D. Craig, “Handbook of Tasmanian Revenue Stamps”, Revenue and Railstamp Publications, Dynnyrne, Tasmania, 1997, plus supplement (2002). The Courier (No. 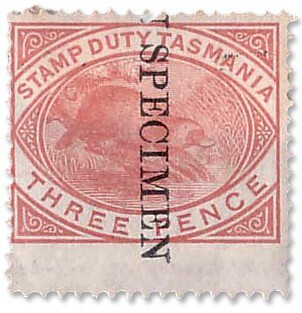 35), “Tasmanian Revenue and Railways Special Edition”, (2003). These publications are readily available and contain many references to earlier philatelic literature, including Basset Hull’s book on Tasmania. 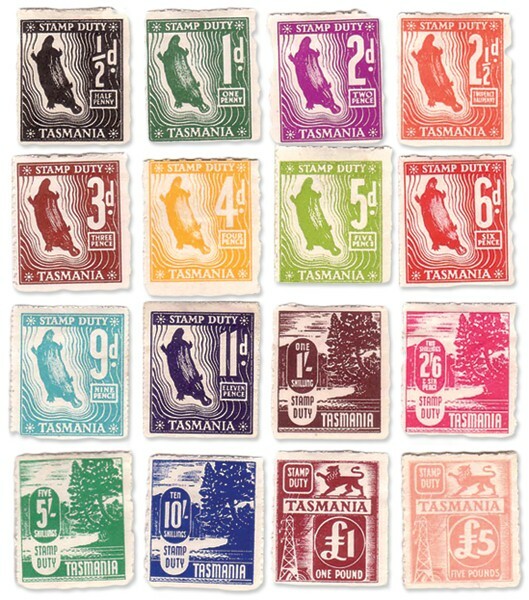 Andrew Wilson’s serial in Western Stampgroper (1991-1993) provides a useful overview of many of Tasmania’s revenue stamps. 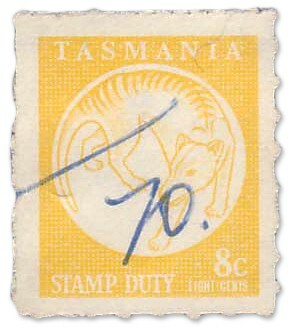 Basset Hull wrote a useful serial in Australian Stamp Monthly (1930-1931) on Tasmanian revenue stamps.